Spray booth lighting has changed significantly since the early days where simply putting as much light as possible into the booth was the cure for all lighting issues. Although having abundant light in an auto body repair paint booth is certainly important, just adding more and more powerful lights when issues with finish quality and productivity arise is hardly an efficient answer. A paint spray booth is more than just a room for applying finishes and coatings, and must be treated as an environment independent of the auto body repair shop. While simply adding fixtures does indeed add more light, it also increases energy use, maintenance costs, and issues with heat, light fixture failures and operating complexity. A paint spray booth is a specialized environment with unique requirements and purpose specific traits that require all parts of design and construction to work together to form an effective whole. Rather than be considered singularly, paint spray booth lighting should be part of a comprehensive spray booth system chosen according to its ability to maximize the spray booth’s performance. The typical paint spray booth commonly found in auto body repair facilities is traditionally equipped with T12 fluorescent light fixtures. Long popular with spray booth operators due to their good output, low cost, and wide assortment of bulb choices, T12 fixtures are nonetheless slated for obsolescence due to new federal energy management guidelines that will eventually phase out the T12 in favor of more efficient T8 fluorescent fixtures. The 2005 Energy Policy Act and the Energy Independence Act of 2007 are going to directly affect the availability of potential replacements like eight foot long T12 fluorescent tubes, T12 U-tubes, and T12-f34 tubes, with the net result being their discontinued production and unavailability. F40-T12 fluorescent tubes are already being discontinued, with only the current stocks still available for purchase. There are of course some exceptions contained within these new energy policies, but for the most part, the days of paint booth operators simply loading their spray booth with T12 fluorescents are over. Considering the fact that there are already excellent alternatives to fluorescent light fixtures available, and that loading an auto body repair paint booth with as many lights as possible is already a poorly efficient way to produce illumination, this is not an entirely negative development. New lighting technologies like LEDs offer the ability to produce illumination that not only rivals or surpasses the fluorescent fixture in light output, but reduces costs across the board as well. While almost anyone familiar with lighting already knows that the LED is a highly efficient light source, less understood are the reasons why they are so much more efficient. Here’s a hint, it isn’t just because they produce more lumens per watt, and thus produce the same amount of lights while using less energy. For paint spray booths, the efficiency and effectiveness of LED light fixtures stems from the unique way in which LEDs produce light and the inherent design and construction of the LED. In the traditional fluorescent tube, light is produced by using two electrodes to create an electrical arc, which then excites gases and metals contained within a sealed glass tube to produce light. Since the fluorescent tube is round, and the gas ignited along the length of the tube, the resulting light is radiated in all directions. As a result, when you place a fluorescent tube over a given area, only a small percentage of the light radiated from the tube will reach the targeted area. The rest of the light is radiated in other directions, resulting in a lot of light wasted illuminating ceilings, walls and empty space. This is why fluorescent light fixtures usually incorporate a reflector system in order to try and redirect much of this 360 degrees of radiated light downwards towards where it is needed. While this works, much light is still lost due to reflector inefficiency and dissipation. LED tube lamps designed to replace fluorescent lamps in the spray are booth are much different. LEDs produce light through an electrical process which passes electricity through a small piece of semi-conducting material. As the electrons pass through, they are basically multiplied and cause even more electrons to radiate freely away from the semi-conductor. This is a greatly simplified explanation intended only to demonstrate a point, so bear with us here if you will. Because of how LEDs produce light, their design and construction is such that an LED resembles little more than a tiny flat square. As a result of this shape, light is emitted only from the top surface of the LED, resulting in light that is highly directional in nature. In fact, this highly directional nature was a major problem for early developers of LED lights as it made it difficult to produce an LED bulb that would evenly illuminate a room in the same manner as a regular incandescent light bulb. 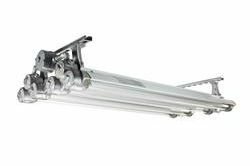 Although this problem has largely been solved for the manufacture of incandescent bulb LED replacements, when it comes to replacing fluorescent tube lamps, this highly directional light production is an efficiency bonus. LED manufacturers can in fact now produce LEDs which emit light over a carefully specified angle of radiance such as 120 degrees or 150 degrees rather than the 360 degrees of traditional fluorescent lamps. In an LED tube lamp designed to replace fluorescent fixtures in the spray booth, the LEDs are arranged in paired rows on a flat circuit board that runs the length of the tube. One half of the tube is an opaque material such as aluminum to provide strength, and the other half a clear material such as glass or polycarbonate. The LEDs face the clear half of the tube, and emit their light only over a 120, 150, or whatever degree of radiance the manufacture has designed into them. When installed in a typical fluorescent spray booth type fixture, the result is that ALL OF THE LIGHT is radiated down onto the work area. So, not only does the LED spray booth light fixture produce as many or more lumens per watt as a fluorescent, but it RADIATES LIGHT MORE EFFICIENTLY. The net result is more light where it is needed, using fewer light fixtures! As you can likely now see, new lighting technology like LED spray booth lights not only offer a replacement alternative to the soon to be obsolete T12 fluorescent, but they offer a major performance improvement as well. Where you may have once been frustrated by dark spots, poor light uniformity, and the cost of maintaining several large and inefficient fixtures that frequently needed lamp and ballast replacements, LED paint booth fixtures can solve every single one of the problems while improving performance and saving you money as well. Even better, LED light fixtures offer the paint spray booth operator the ability to design his lighting to work more efficiently with the size and shape of his paint booth, putting light precisely where it is needed and not where it isn’t. Indeed, in this case, what worked in the early days is not only no longer an effective answer, but it was never a really good solution to begin with. Paint booth lighting used to be compromise between cost and effectiveness. With LEDs, this is no longer the case.